Adults casually say "it's a small word" when they bump into someone they know from childhood or they strike up a conversation with someone who knows a friend of a friend of theirs. Casual or not, it is a small world, populated by people and creatures as different as Summer is from Winter. 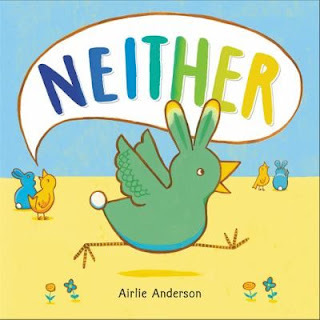 Neither, a picture book by author/illustrator Airlie Anderson, shows us, with colors, bunnies, birdies, and something in between, two different ways we can choose to handle our differences. In the beginning, the world in the book is populated by "these" and "those". It works for them. They have an arrangement. They have a certain way they do things. To their utter consternation, a new thing hatches in the middle of their world. It calls itself "both", but This and That call it "neither" -- and they send it away. Neither just doesn't fit in. Neither flies away looking for "Somewhere Else"...I won't ruin the ending. Neither is a celebration of diversity. 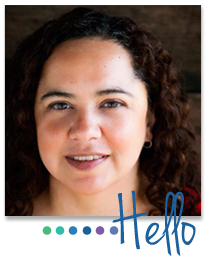 The fact is that young children are growing up in a much more connected, inclusive world that previous generations. It is given that they will at some point come into contact with someone who is different than them. I love this book because it helps them see how cool that is and how much we all have to contribute. It also looks very Easter-y so this is a good time of year to share Neither with your kids.